Share and tag your favorite poster in each category of the Bowling Green International Festival K-12 Student Poster Contest to encourage your friends and family to vote for your favorites! Voting ends tonight at Midnight. The designers of both the judged and the People’s Choice awards will receive a trophy. 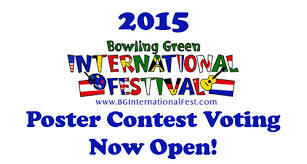 They will also by recognized during the opening ceremony of the Bowling Green International Festival on September 29. The opening ceremony is conducted by Festival Board Members Hannah Barahona and Leyda Becker at 8:45 a.m. on the Diversity Stage.